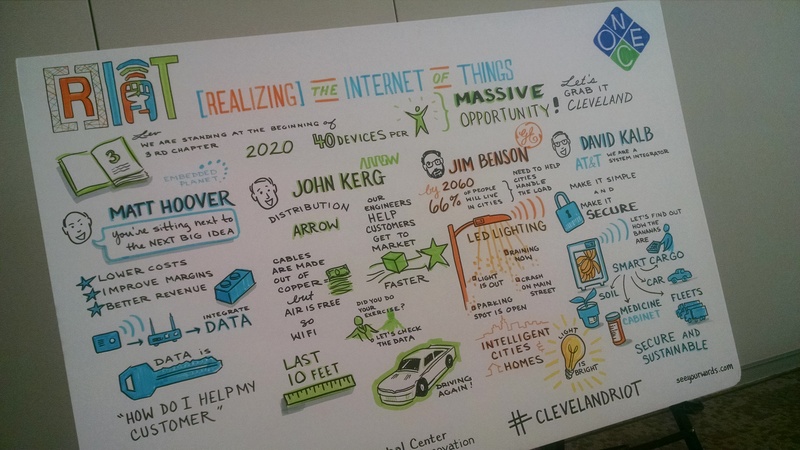 BlueBridge Networks was honored to sponsor and participate in the IoT Olympiad March 13-14 at Case Western Reserve University along with One Community. OneCommunity and its CEO , Lev Gonick have taken the lead encouraging the region to “Dream Big”. The Internet of Things ( IoT) , the focus of the IoT Innovation Olympiad inspired think tank-type concepts at a shark tank-style competition enticing over 40 of Northeast Ohio’s best and brightest STEM-enthusiastic young women ages 13-18, to vie for cash awards at Case Western Reserve University last month was a success. I had the distinct honor and joy to be a judge. What an awesome event! Thanks and Kudos to OneCommunity & Case Western Reserve University for allowing BlueBridge Networks to participate and sponsor. The Olympiad proved to be a multicultural representation of our region. The depth and breadth and feasibility of the many well articulated ideas generated by the young women during the Olympiad were impressive indeed. In a short time the girls effectively gave wind to sails of ideas as how to improve our world in areas such as the environment, mental health, logistics and transportation to name a few. It was refreshing to me to watch how a common theme emerged among the presentations- the ability to give “voice” to things important to the teams in areas such as suicide prevention, the environment, depression and mood management, safety and protection. The vision and collaboration generated that weekend gives hope to the idea that young women inspired, empowered and engaged along with the IoT, indeed has the power to change the world and improve the quality of life. It was an ingenious grocery shopping application created by Sasha Desberg and Katie Arendt that took top spot. Their winning app, an inspirational retail-based application that promotes shopping smarter at grocery stores was designed to work from the user’s grocery list and preferences, assisting in finding items, tracking likes and utilizing electronic payments. Other winners were equally inventive. Alyssa Spencer, Eliana Good and Tarini Singh, for example, took second place with an app enabling communication through muscle movement of brain waves for those unable to speak. Third place winners, Chamielle Burton, Tameka Coleman, Ana Spates and Taylor Nunley aimed at alleviating depression through an uplifting musical playlist while Alanis Chew and Carli Sebest, the fourth place winners, introduced an app that makes real time language translation possible during phone conversations. 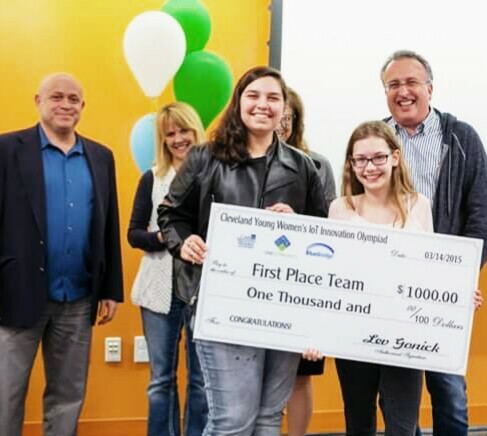 The IoT Innovation Olympiad winners received awards ranging from $1,000 for first place to $500 for second and $250 for third and fourth, respectively. 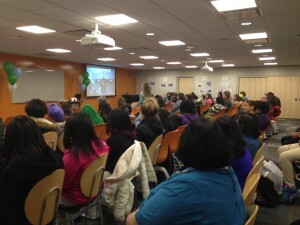 The event, sponsored by OneCommunity, Case Western Reserve University, BlueBridge, OEConnection and CBC Magazine featured prominent female speakers including: Kelly Zelesnik, Dean of Engineering Technologies, Lorain County Community College; Dr. Monique Wilson, Executive Director, Center for Information Technology Training, Corporate College, Cuyahoga Community College; Nichelle McCall, CEO, BoldGuidance; Stephanie Takai, CEO, Innovative Devices, Inc.; Rachel Wilkins Patel, Founder, HER Ideas in Motion; and Dr. Alexis Abramson, Professor of Mechanical and Aerospace Engineering and Z. Meral Ozsoyoglu, Professor of Computing, both of Case Western Reserve University. According to BlueBridge Networks Managing Director/Partner, Kevin Goodman, “The great work ethic that dates back to the captains of industry and the Industrial Age remains here today. Our people are scrappy, able-bodied people. It’s in their DNA.” Some reasons why his company is in City of Cleveland – Cleveland City Hall. 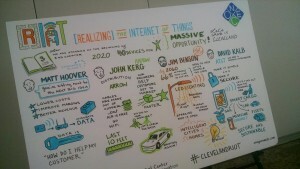 And why we are poised for the Cleveland [R]IoT…. Onward Cleveland! OneCommunity is a nonprofit organization based in Cleveland that works to expand high-speed broadband access and adoption to strengthen Northeast Ohio. OneCommunity’s vision is that advanced digital capabilities and effective use of technology will help transform the region and establish it as a national hub for innovation and economic growth. Kevin Goodman is the managing director and partner with BlueBridge Networks, a downtown Cleveland-based data-center business. He can be reached at (216) 367-7580, [email protected]. 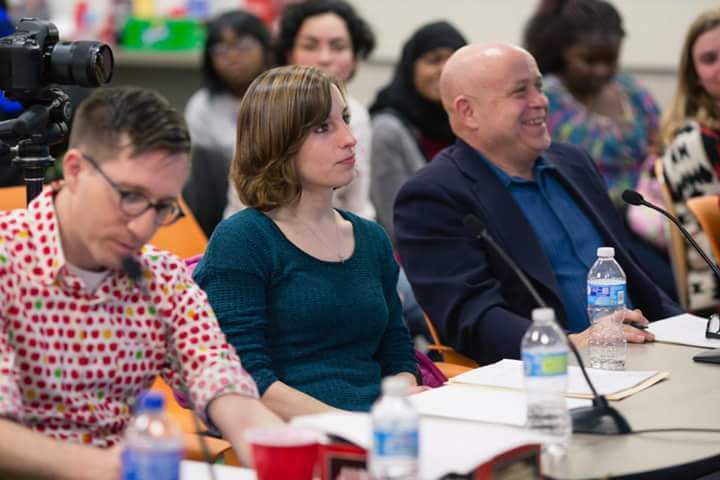 This entry was posted in Building Community, In the News, Operational Excellence, Uncategorized, Visionaries and tagged Cleveland, cloud, corporate giving, data center, entrepreneurism, partnership, team building, technology, volunteering. Bookmark the permalink.